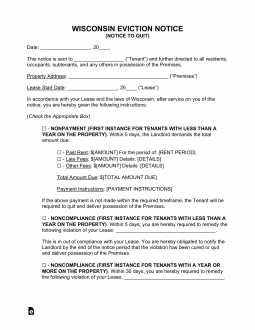 The Wisconsin eviction notice forms are forms that are given to lessee’s upon their failure to oblige to the terms and conditions of a written lease agreement. The notice can either give the tenant a period of time to correct the issue or notice that states their rental contract has been terminated on specific grounds by the landlord. Wisconsin has a confusing array of laws and it is best for the landlord and tenant to use the Eviction Notice Chart provided by the State to know where they stand. 5-Day Notice to Quit (Leases of a Year or Less) – 1st violation for lease terms of a year or less. This is for nonpayment, noncompliance, or an unlawful activity violation. 14-Day Notice to Quit (2nd Violation) – 2nd violation for any type of lease term. Only may be served to the tenant when there has been two (2) separate violations within a twelve (12) month period. 28-Day Notice to Quit (Month to Month Tenancy) – Used when parties seek to end a month-to-month tenancy and have to provide notice of twenty-eight (28) days to the other party. 30-Day Notice to Quit (Leases for More than a Year) – 1st violation of a lease that has a term of a year or more. Rent is due on the date that is specified in the lease agreement between the landlord and tenant. The renter has five days to pay after the landlord provides notice before landlord may continue in court. Step 2 – If the tenant does not respond either by vacating the premises or by rectifying the situation (if that is an option), the landlord may proceed to Small Claims Court in the county in which the property is located and file a Summons and Complaint. You will have to complete and Non-Military Service Affidavit and Affidavit of Service of Notice. You will need five (5) copies. Step 3 – The court court will keep the original and you will have to deliver the packet to a process server to serve on tenant. The tenant must be served at least 5 days before the court date and has the right to defend themselves by filling-in the Answer Form. Step 4 – If the landlord prevails, then the court will issue and order for a Writ of Restitution. The landlord will bring this order to the sheriff along with a set of keys to the property and a letter of authority from a mover. The sheriff will have ten days from receiving the order to evict tenant. The complete Name of each person who is to act as a result of this Notice should be recorded on the first blank line of this page. The first area will solidify which Rented Property this document applies itself to. The City, County, Zip Code, Building Number/Street, and Unit Number of the Leased Property this Notice applies to must be accurately supplied in the opening statement (beginning with “The premises…”). There will be several empty spaces provided for this purpose. The Calendar Date when this document was Signed must be presented in the next statement (look for the term “In accordance…”). Fill in the Calendar Day, Month, and Year (documented on the Lease) as the Signature Date into the blank spaces provided. The following statements in this document will each describe Notice Terms. Each of these Notice Terms will have a corresponding check box. Select the statement you wish to issue to the Addressee or intended Recipient of this document. Select “Nonpayment (Tenancy Of A Year Or Less)” to give a Tenant who has not paid his or her Rent Five Days to submit a Payment or evacuate the Leased Property and relinquish possession. This statement will require you to designate and report an Authorized Agent who may accept the delinquent Tenant’s payment on the first blank line. Following this, report the full sum the Tenant owes, the required Payment to be allowed to stay, and the Time Period being paid for with the required Payment. Select “Noncompliance (Tenancy Of A Year Or Less)” to notify a Tenant that a Lease Violation must be mended within Five Days or the Landlord shall expect the violating Tenant to return the Leased Property. This sentence will have a blank line requiring the exact violation to be documented. Select “Noncompliance/Nonpayment (Tenancy of More Than A Year)” to notify a Tenant that he or she must turn over the Rented Property within Fourteen Days for violating the Lease Terms for a second time in Twelve Months.” This violation must be fully described on the blank line provided. Select the check box associated with “Illegal Activity” to inform a Tenant that he or she has Five Days to deliver possession of the Rented Property to the Landlord/Agent due to observed Illegal Activity. A description of this activity must be reported on the blank line in this sentence. The check box associated with the statement “Month To Month Tenancy – I am your Landlord” should be marked, if the purpose of this form is to notify a Tenant that his or her Monthly Lease shall terminate on the Date you enter in this statement. The Date you report here must be at least Twenty-Eight Days after the next Rent Payment is due from the Tenant. The check box associated with the statement “Month To Month Tenancy – I am your Tenant” should be marked if the purpose of this form is to notify a Landlord that his or her Monthly Lease will terminate on the Date listed here. The Tenant may name any Date they wish as the Termination Date so long as it is at least Twenty-Eight Days from next Date when the Tenant must pay Rent. The paragraph that begins with the words “You Are Further Notified…” will have a Signature Line which must be Signed by the Landlord/Agent issuing this Notice. Note: This line should not be Signed if a Tenant is issuing this Notice. The next area, “Certificate of Service,” may only be completed and Signed by the individual who charged with serving this paperwork to the Recipient. The first statement will provide a report on the Date this form was delivered as well as the individual who accepted it. The check boxes below this initial statement will each contain a Delivery Result. That is, whether the documents were delivered directly to the intended Recipient, to another party, or mailed (using First Class Mail). This may be indicated at the time of Delivery by marking the appropriate check box. The required Signature Line will be at the end of this section.